Event Log Explorer is an application that allows you to view, analyze and monitor recorded events in System, Application, Security and other Windows OS logs. The program was designed to speed up and simplify monitoring and analyzing of recorded events in the logs of Windows operating systems. 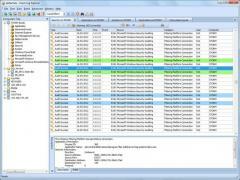 - Lets you access event logs and log files generated by Windows on local and remote workstations and servers. - Support is enabled for classic EVT files (format of Windows NT event log) and new EVTX files (Crimson event log format). - Events are loaded into an improved internal local database or into memory for high performance. - Notifies you about problems as soon as they happen through active alerts and monitoring. - Consolidates all events into a single place. - Provides options for log loading for event logs pre-filtering. - Allows you to set advanced filtering using custom criteria. - Event logs backups can be performed manually or automatically. - Various formats are supported for printing and exporting. - Provides analytical reports consisting of pivot charts and summary tables. - Internet Connection for requesting and obtaining a free license.